The Blackford Centre is now offering a herbal course that will give you the opportunity to earn a Diploma in Herbal Medicine -- without having to commute to classes, rearrange your schedule, or spend a lot of money on books, tuition or lectures. Written by practising herbalists, the herbal course contains 14 modules, offering you truly comprehensive, accurate, up-to-date information. You’ll be assigned a private tutor who is a practising herbalist -- not a college lecturer -- who will review and grade your assignments and offer practical, real-world advice. With this herbalism course, you can study at your own pace, on your own schedule, whenever and wherever it’s convenient for you. 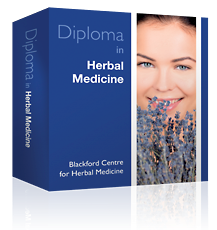 It’s simply the best way for someone with a full, busy schedule – like you – to acquire a Diploma in Herbal Medicine. Because the course is distance learning, and we don‘t have to pay for classrooms, furniture, and other expenditures, we can afford to offer it to you at an incredibly low price. Many people have successfully completed the course, and gone on to become practising herbalists. Why hesitate? This is a great opportunity for you to realise your dream of having a fulfilling, well-paid career as a professional herbalist. Enrol on the course now, and help yourself to a fantastic income and lifestyle while helping others.